If you own a Ford F-150 and would like to protect your cargo from the elements, you may always opt for a practical tonneau cover or a bed cap. However, Michigan Vehicle Solutions takes things quite a bit further with their fastback-style bed cap called the Aero X. Once installed, it makes the F-150 look like a retro Mustang that’s into fast food. The U.S. $4,000 add-on can be installed on all Ford F-150 trucks produced in 2015 or later. The company plans to expand its offer to other brands eventually. The Aero X bed cap is made of fiberglass and lifts easily with the help of gas struts. It comes lined with LEDs from the inside, making it easy to see things in the truck bed even at night. It also houses a third brake light. Paid options include a rear spoiler, vented side quarter windows and a high-end audio system. 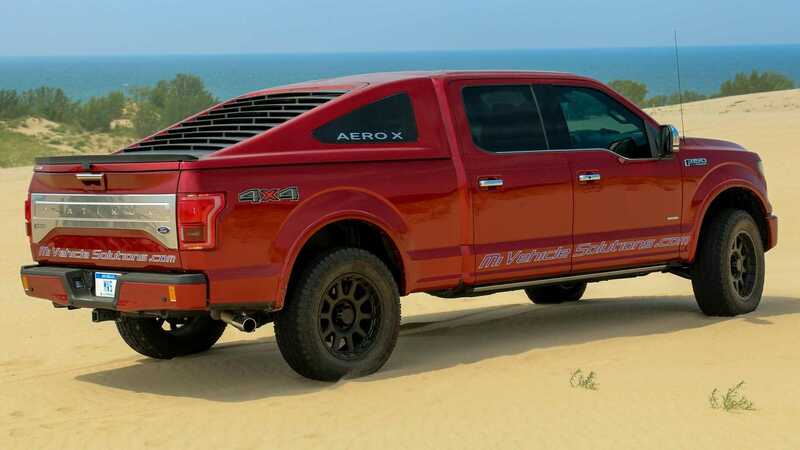 According to Michigan Vehicle Solutions, the improvised “F-150 Fastback” also benefits from lower aerodynamic drag, improving overall fuel efficiency. Frankly, we can’t see many people buying it over fuel economy concerns. The looks are a totally different story, though.